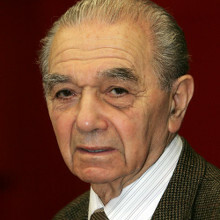 Walter was born 1923 in Vienna. He was 14 when Nazi Germany occupied Austria in the Anschluss in March 1938. Walter witnessed the Kristallnacht pogrom on the night of 9th-10th November 1938, when Jewish synagogues, shops, businesses and homes were attacked and destroyed across Germany and Austria. In Vienna, hundreds of Jewish men were arrested following the pogrom and sent to Dachau concentration camp. Walter’s parents decided to send him to Britain on the Kindertransport. The age limit for the Kindertransport was 16: Walter was 15 but his, sisters being 17 and 18, could not join him. The eldest managed to get a domestic permit where the lower age limit was 18. She arrived in Britain on 4th July 1939. The younger sister, however, was too old for the Kindertransport and too young to get a domestic work permit. She had to stay in Vienna and was sent to Terezín (Theresienstadt) and subsequently to Auschwitz-Birkenau. Walter’s father was sent to Auschwitz on 29th September 1944 and his mother and sister on 23rd October 1944. This was the penultimate transport to Auschwitz, just 3 months before the camp was liberated. It was only after the war that Walter discovered his parents' and sister's fates. When Walter arrived in Britain, he was sent to a camp for refugee children at Dovercourt in Essex, where he stayed until February 1939 when he was sent to a farm in Northern Ireland. Walter worked on the farm for 3 years. Walter had to report to the police, but as farming was a 'reserved occupation' (important for the war effort) he was not interned as other 'enemy aliens' were. Walter joined the British Army in March 1944 and served in Belgium and the Netherlands later that year. Whilst on embarkation leave, Walter married Herta, who he had met in London in 1942 and who had also came from Vienna on a Kindertransport. The couple returned to Austria in 1946 and had two sons. They later moved back to Britain in 1957. Walter’s testimony can also be found in the third episode of the BBC Documentary Nazis: A Warning From History.